Join Sarasota County Schools for a unique Parent Leadership Council event at Gocio Elementary Cafeteria on Saturday, April 6, 2019, from 9–11am. 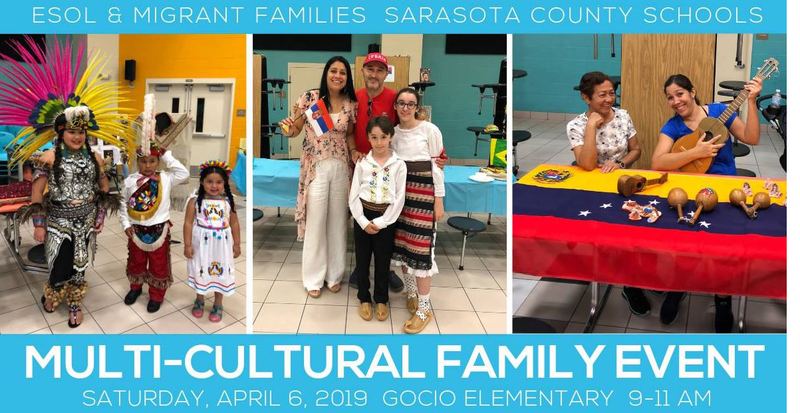 There will be cultural exhibits presented by parents that have students in the Sarasota County School District ESOL (English for Speakers of Other Languages) program to showcase the multi-cultures present throughout our schools. They will be sharing photos, crafts, costumes, music, traditions and more! While you’re there, be sure to talk to a Suncoast Campaign for Grade-Level Reading Engagement Team member about Mind in the Making and Vroom.